What do you think – when you heard about Pool House? Many of us just think about a house, which is near by pool or house with a pool. Their beautiful view of swimming pool from the house space. But today here – I would like to put one of the good organic architecture example by 42mm Architecture, created near by New Delhi. 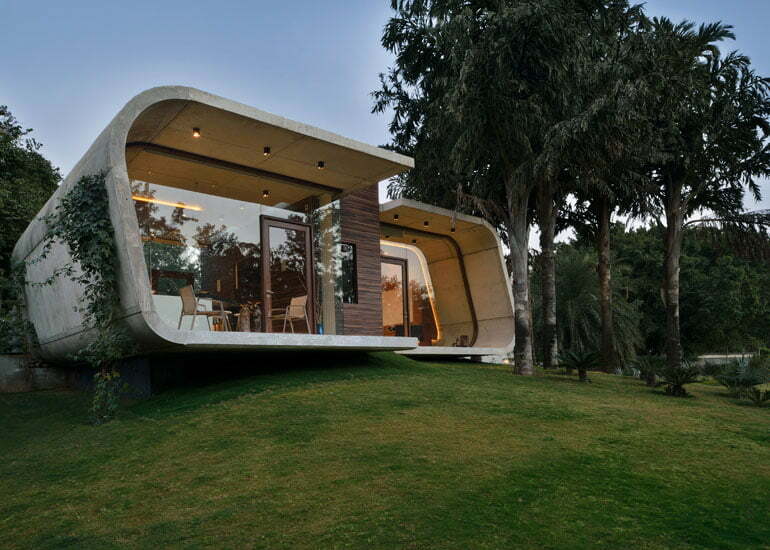 This is totally modern and organic architecture, created with concrete loop and forms. 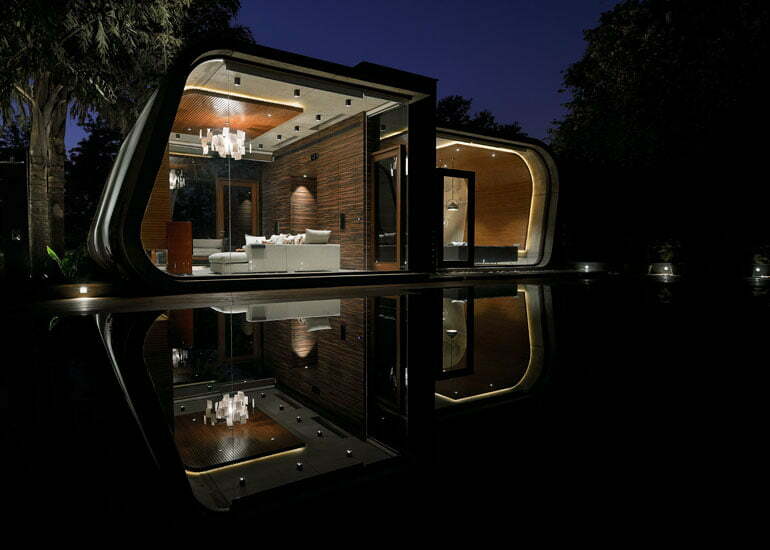 Modern pool house architecture create their poem with dynamic walls, roof, flooring and looping of forms. In the background of green and lusty garden of New Delhi, India. As explain by architect of the pool house, this is a 400 sq. mt. of smooth concrete shell structure, which is enveloped entirely front and back with through vision glass. With full height glazed surface, occupant of the house get view right through. And the pool house is a pebble in the grass. Design Brief of Pool House. 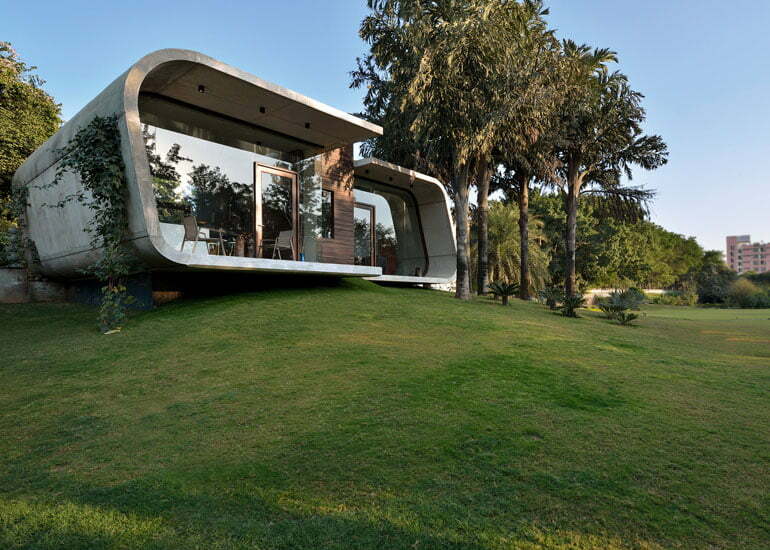 Organic building form of house fit into the landscape of the garden. Pool House designed in suite with context. A singular, bold and robust frame, asserting pool house presence. Smooth or Curved edges of the concrete form, create a pebbles in grass effect. Also, smoothed edges trying to blend this stark object with the landscape. Pool House have two large rooms, both designed to function as entertaining areas when the clients have guests over. Using pre-stressed concrete structure technology, made it possible to slightly cantilever the structure over the edge of its sloping site. Concrete left exposed both – in and out side to create “Exposed Concrete” Effect of house. But, inside floor is polished to give more pleasant flooring feel under your foot. For breath and weather naturally concrete, avoid using any kind of artificial pigments and enhancers. A boxy wooden volumes divides the structure in two i) for a toilet ii) and for a pantry. Some wooden touch given in two main rooms. Timber Framing a cinema screen in the lounge space, and wrapping around a seating area in the bar room. 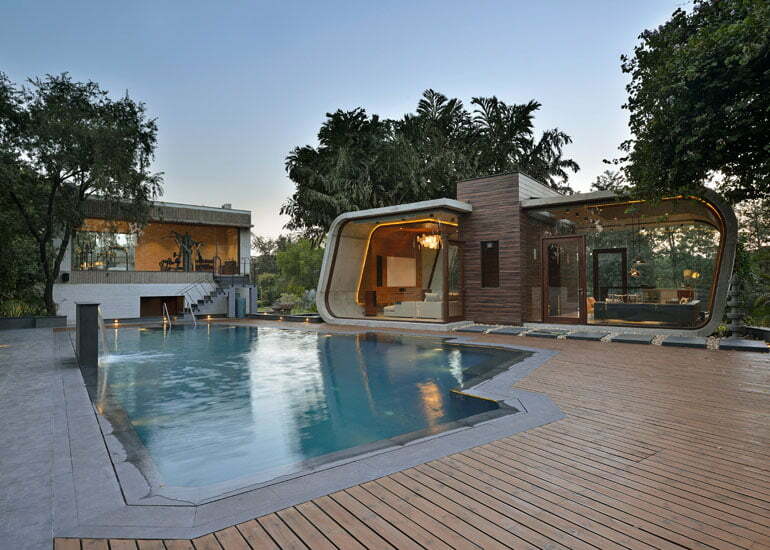 Images of Latest Indian Pool House With Modern Dynamic Architecture Style. A house is place such a way that get maximum view of pool. The house set it’s base on higher side of contours of terrain. So, get clear surrounding greenery exposure with full height clear glass window. 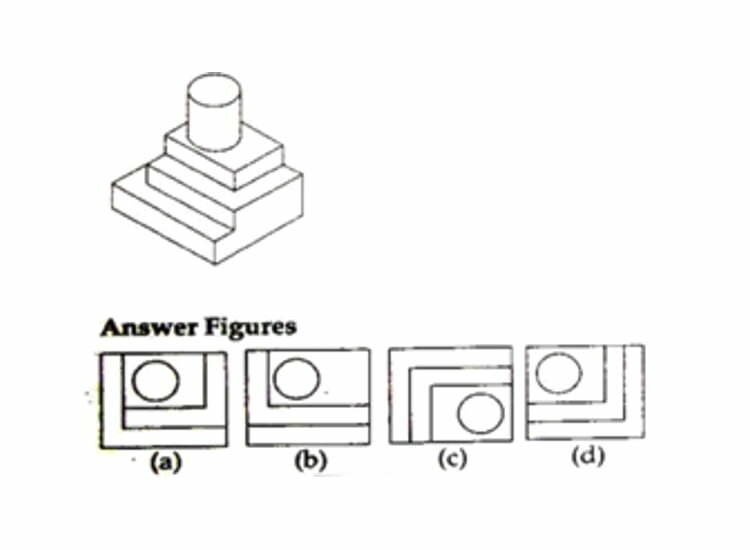 Know more about Indian Contemporary Architecture. Modern House Design With Inner Courtyard In Bengaluru. Modern Fort House By SPA, Hyderabad. 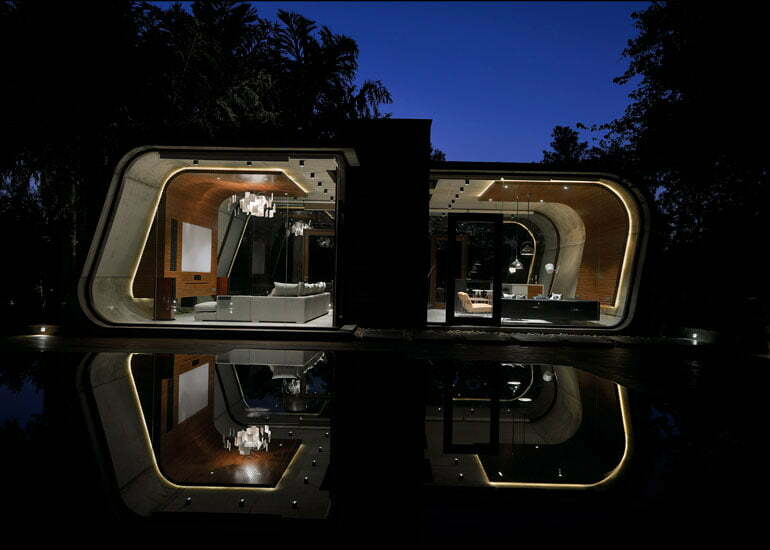 Shipping Container House For Artist Is a Modern Shelter. 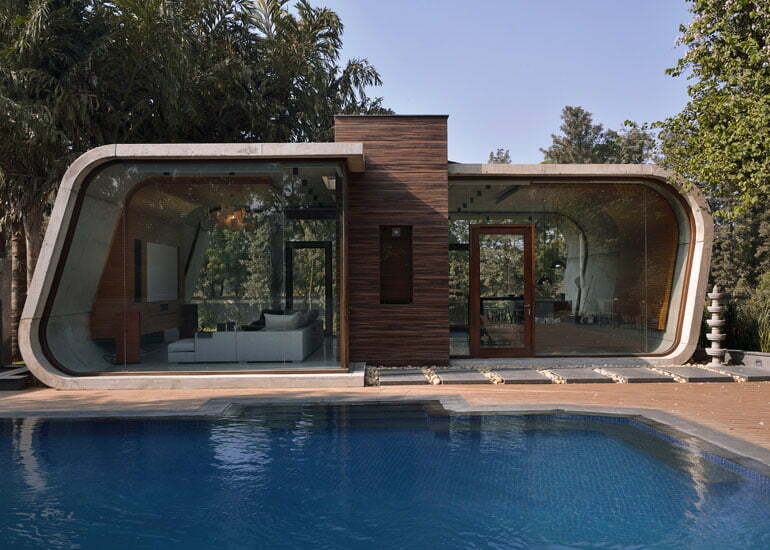 More Pictures about Beautiful Pool House on Next Page!! !